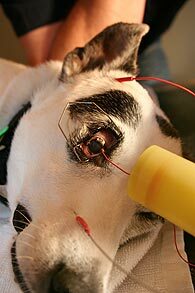 This method of cataract removal is the most advanced technique in animals and people. 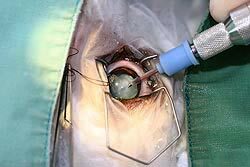 The cataract is ultrasonically broken into very small pieces, then gently vacuumed out of the eye through the needle. The Storz machine used by this centre allows the surgery to be completed through a very small 2.5mm incision. Many pet’s have artificial lens prosthesis placed back into the eye after cataract removal, to restore even better vision. This is a surgical freezing technique, which is valuable in the removal of abnormal eyelashes, treatment of various tumours, glaucoma, luxated lens removal surgery, and retinal reattachment surgery. At the Auckland Animal Eye Centre we use a finely controlled nitrous oxide driven cryosurgical unit, allowing access to treatment without the necessity of irregular supply and storage of liquid nitrogen. The retina is the nerve tissue at the back of the eye, which acts like the film in a camera and produces electricity which an ERG measures. The ERG is valuable in assessing retinal function when the retina can’t been seen due to the presence of a cloudy / opaque cornea or lens. It can also help with possible brain related vision problems. 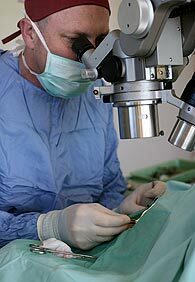 The majority of our surgical procedures are performed using an operating microscope. This allows surgerys to be completed using the most modern, ultra fine instruments and sutures, minimizing inflammation and scarring. Responsible breeders are screening their stud animals and puppies for inherited eye diseases. The complete ophthalmic examination and certification provide breeders with vital information improving future eye health in purebred animals. We can provide certification for in house, New Zealand and Australian AECS schemes.